ATHENS 1962: two sailing enthousiasts, Dimitri and Odile Gritsis established ArchipelClub. 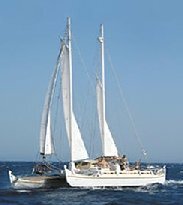 It was the very first sailing boat charter company in Greece. Contrasting to the low, wet and intricate yachts of those days, their fleet consisted of simple, user-friendly, ocean capable boats. PAROS 2003: after two decades of circumnavigations and skippering of large yachts, their son George decided to take up the family business. Assisted by his wife Vanessa, they share the same principles which led the previous generation: guests should be contented and happy to visit again, passion of sailing and love of the Aegean Sea, operate boats that are fun to sail, no-nonsense and above all sea worthy. We are the stepping stone for the next generation!